The 24-Hour Mommy: I'm a shock proof Smart postpaid subscriber! I'm a shock proof Smart postpaid subscriber! I am the official errand girl in our family. I'm the one who waits in line in the bank to pay the bills and I'm also the one who brings my son to his activities in and outside school. I do the weekly groceries and I can shuttle from one building to another to accomplish tasks. No free WiFi at this Starbucks branch near Rap's Kumon center so I had to use my Pocket WiFi. But beyond my wife-slash-mom-slash-errand girl existence is a freelance web content editor and writer who needs to be online as much as possible throughout the day. When I'm out on errands, I keep in touch with my bosses and my team of writers through my mobile phone and tablet computer. I can't avoid not to use my Smart BRO Pocket WiFi when I'm not connected to a free WiFi connection. My monthly data plan only has 50 free Internet hours and I'm being charged Php 10 per 30 minutes beyond my free hours. Last Holy Week, on our trip to Bataan, we had the Pocket WiFi on during the entire drive because I needed a strong Internet connection for Google maps to be accurate. We arrived in the resort just in time to enjoy a relaxing afternoon at the beach. Of course, I wasn't able to resist instantly sharing photos of the beachfront especially the sunset. I just had to show it to my friends over at Instagram, teehee! At the beachfront of Bataan White Corals in Morong. I did not count the hours I spent online beyond my free 50 hours. I know that even if I used the Pocket WiFi for more than 32 hours during our weekend getaway, I'll only be paying a maximum bill of Php 999. This is possible with Smart's Shock Proof data charging feature. With Smart's Shock Proof data charging feature, postpaid subscribers like me can finally relax every time the monthly subscription bill arrives in the mail. Let's say I already consumed my 50 free Internet hours prior to our weekend getaway. Then, while on vacation, I used the Pocket WiFi for 32 hours. Without Shock Proof data charging, my bill computation would be Php 495 (my monthly service fee with free 50 hours) + Php 640 (32 hours x Php 20 since it's Php 10 every 30 minutes) = Php 1, 135. 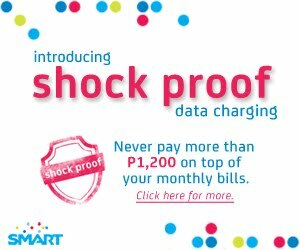 But with Smart's Shock Proof data charging, I would only pay the anti-bill shock cap of Php 999. That means to say, I got around another 7 hours of free Internet browsing. It's like paying for an unlimited Internet connection on the go when I need it. Our unlimited Smart Bro connection at home is also at Php 999 monthly. One more thing I'm happy about is the data cap for Smart mobile data plans as my husband and I are both on Smart postpaid lines. With my husband often on a business trip, he can comfortably surf the Internet on his phone and keep in touch with the family without ever exceeding the anti-bill shock cap of Php 1,200 on top of his monthly phone bill. Since he's on Plan 800, his bill would never go beyond Php 2,000. Mine, on the other hand, will only be a maximum of Php 1,700 since I'm on Plan 500. Subscribers need not register for this anti-bill shock feature to work. Smart automatically switches to the unli data plan once the data cap is reached. For more information, you can visit Smart's website or a Smart wireless center nearest you. Nice to know na meron palang ganito. I'll tell my husband about this. Thanks Mommy Mauie. Ang galing ng feature na 'to ha. mahina kasi ang signal ng Smart sa amin e kaya di ako makapagpakabit ng post paid Smart internet. Ay bongga naman ng SMART. Sayang i'm trapped with Globe's postpaid BlackBerry plan 999. Sarap ng work mo, sis. On the go! Hehe. Can't wait to switch to Smart permanently, with a line. And the new iPhone that comes with it totally helps make the switch easier. This is so nice! :D I'm not a postpaid subscriber but when I apply for one I think I'll go for Smart too. Our internet connection at home is by Smart Bro and I have a Smart Bro plug-it. Really love their service and ang lakas pa ng signal sa area namin.